Read FBC Review of "City of Dreams and Nightmare"
INTRODUCTION: I have to admit I have only vaguely heard of Ian Whates before 2010, so to my regret I did not include his two early 2010 novels in my 2010 Anticipated Books post; and what novels! 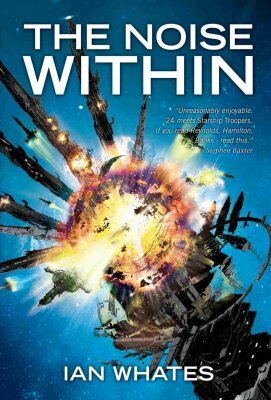 An excellent steampunk fantasy City of Dreams and Nightmares and now The Noise Within which is the debut of a space opera series that has great potential and has become a big time personal favorite. And to top it all, Mr. Whates is the editor of the anthology Conflicts which I have on pre-order and plan to read and review on publication, while City of Hope and Despair is another anticipated novel to come later in the year. FORMAT/CLASSIFICATION: The Noise Within stands at about 330 pages divided into nineteen chapters and follows four pov's, two main ones that have most of the pages and two others that may become very important as the series progresses. Leyton is an eyegee - kind of like Cormac of N. Asher's novels - a special agent with an intelligent gun for the human government ULAW which was put together at the end of a century long war between the de facto winners ULW (United League of Worlds) and the Allied Worlds who got a smaller share of the ULAW (that A). Philip Kaufman is the young CEO of the leading space engine firm, heir of genius father Malcolm who brought the firm to its current eminence by inventing the Kaufman drive which proved itself to be the best way to generate the wormholes used in FTL and later sort of uploaded himself into a pseudo-AI - here there are echoes of P.F. Hamilton and the Mandel series not to speak of the later ones - though Philip refuses to recognize the AI-Malcolm as more than a pale copy of his late father. Kyle is a ship engineer, war veteran and now bored mechanic on a luxury ship, a sort of "just in case" since the vessel is super redundant. Kethi is a human "intuitionist" - echoes of IM Banks - who is from a habitat that made itself scarce in the war, established a while ago by a charismatic leading figure of the Allied Worlds who became a "prophet" preaching the message that aliens will come and threaten humanity soon, so humanity should prepare for that rather than fight a stupid civil war. 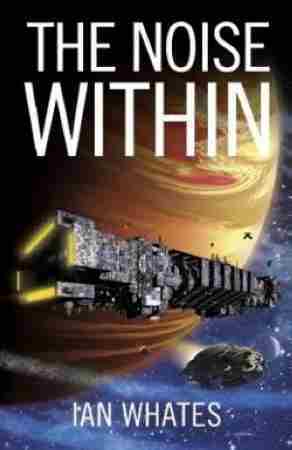 The Noise Within is pure space opera of the highest caliber. Then the action switches to Kyle whose boredom on the luxury liner he is supposed to "maintain in flight" is rudely interrupted when the weird ship of the title The Noise Within appears from nowhere and effortlessly hijacks the liner and kidnaps some rich passengers for ransom, though strangely encouraging people to "defect". Kyle finds himself stepping forward and is the first one to defect to the rogue vessel. Driven to make his mark, Philip is pushing hard at the one failure his father had, the integration of human and AI and the first AI piloted starship, all this despite muted ridicule from some on the board of his firm. That because Sun Seeker the first prototype AI-piloted ship that Malcolm had built a long time ago during the war, vanished on one of its first trials killing its token crew with acceleration that no human could withstand, so the "wise heads" kind of look at this project as Philip's folly but as long as the firm is doing well and the project is not that expensive... And then AI-Malcolm calls Philip with news about The Noise Within and everything changes. Since maybe The Noise Within is an alien ship, Kethi also makes her way with a crack team to the area the pirate ship roams. The Noise Within is an A+ for me and the series it debuts has a very high potential and I expect it to develop to be among the best space opera series around. Ohman, this sounds AMAZING! I am definitely going to have to check out some Ian Whates! It's time that Ian Whates starts to get noticed. I really liked his City of Dreams and Nightmare novel. I'm not a sci-fi fan, so I'm not sure if I'll check this out, but it seems to me that he's putting quality work. Highly anticipating the sequel, City of Hope and Despair which should be coming on later this year. He's putting out a lot of releases this year, as I think he also has an anthology (don't know if it's out yet), and hopefully people will start reading him. Liviu, did you like this more than City of Dreams and Nightmare? If so, was it because of the plot? The characters? Stronger writing? Will be interested in your thoughts on how they compare to each other. I like this site, because I come across books I haven't heard of. The one problem I have is determining what is actually good and what isn't. It seems like every book gets anywhere from an A to an A++. I think that if books got rated B-F too I would have more confidence in choosing from the many books reviewed. I need a more critical read, unless the only books that are posted are the ones that were good. I still like the site though! I don't know if you watch anime at all, but have you by any chance ever watched Legend of Galactic Heroes? It's a very old anime, but it was space opera at it's best (particularly for the time it came out). Highly recommended if you ever find the time. It's a long series though. Sounds like a book i might like to read, thanks for the review. Just finishing the book and unfortunately while reading the connection to "Pandora's Star" by Peter Hamilton becomes apparent. The former being much more enjoyable too. Great review. This book has been on my shelf for a while. It just made the reading list for my vacation planned for next month.